If you’re new to roller derby and the Women’s Flat Track Derby Association (WFTDA), this page will give you all of the information you need about our sport and our organization. The sport of roller derby was first conceived in the 1930s, and was played on a banked track and was popular in the United States until it fizzled out in the 1970s. In the early 2000s, modern women’s roller derby got its start in Austin, Texas. Starting with the Texas Rollergirls, flat track roller derby leagues began forming as businesses run by the athletes themselves. The flat track version of the sport spread like wildfire in subsequent years, as the ability to mark track boundaries on a skating rink floor or other venues, rather than building and storing a large banked track, made it possible to play the game just about anywhere. Today, several hundred leagues exist all over the world. While the original version of the sport eventually became more of a spectacle with fights and other staged theatrics, today’s roller derby is a legitimate sport played by true athletes. The Women’s Flat Track Derby Association (WFTDA) is the international governing body of women’s flat track roller derby representing more than 470 member leagues on 6 continents. The mission of the WFTDA is to govern and promote the sport of flat track roller derby and revolutionize the role of women in sports through the collective voice of its member leagues around the world. 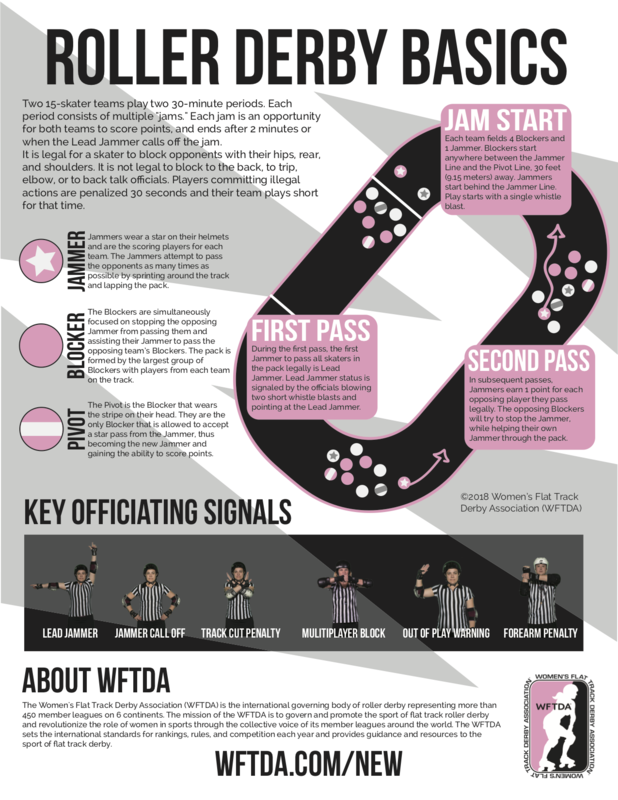 The WFTDA sets the international standards for rankings, rules, and competition each year and provides guidance and resources to the sport of flat track derby. Each WFTDA Member League has a charter team that competes with other WFTDA leagues in sanctioned games that determine placement in the WFTDA Rankings. Check out our Recognized Tournaments which make up part of our competitive season tournaments to find a sanctioned game near you. to the 2019 International WFTDA Championships in Montréal, Québec, Canada. European Cup, a two­ day event with eight competing teams. Visit WFTDA Tournament Central 2019 for information about this year’s tournaments. You can watch roller derby live online through our streaming site WFTDA.tv, or join us live every Wednesday at 6pm ET for Watch Party Wednesdays on our Twitch channel Twitch.tv/WFTDA. Recordings of past broadcasts are also available in the WFTDA.tv Archives and the WFTDA YouTube channel. Looking for live roller derby? Almost every major city has a roller derby league and public games. Google your city and roller derby and find an event near you, or check out our list of WFTDA Recognized Tournaments, and the WFTDA Postseason schedule. Want to get involved in any of the multitude of opportunities to join the roller derby revolution? Visit our leagues page to find a league in your area. Leagues are always looking for skaters to join and often offer beginner bootcamps for those new to skating and to roller derby. Officials are also needed to referee and administer games, and every league is looking for volunteers to help their organization with everything from announcing public games to helping run ticket sales. Women’s Flat Track Roller Derby is a full contact sport for women ages 18 and up (or 21 and up, depending on the league). The WFTDA has a very inclusive view on gender and our member leagues provide a welcoming and accepting environment for anyone who wants to play women’s flat track roller derby.